Coligone comes in a variety of forms, and is a useful digestive comfort supplement. Administering Coligone on a daily basis maintains a healthy digestive system and may combat bloated, gassy or tucked up tummies brought about by stress. It also improves coat condition, brightens eyes and encourages weight maintenance. - FOS (Fructooligosaccharides) and MOS (mannanoligosaccharide) prebiotics to support a healthy digestive tract. -Yea sacc and MOS/FOS Prebiotics encourage hind gut fermentation and actively stimulate fibre digesters, leading to effective fibre digestion. -Seaweed buffer and sodium bicarbonate help maintain healthy gastric acid levels and support a balanced digestive tract. Coligone helps to maintain healthy acid levels in the gut and may be used during periods where disturbance of the microflora has occurred within the digestive tract. It can assist with problems caused by raised acid levels such as wind sucking, tucking up, grumpy behaviour and poor performance in competition horses. It is also excellent for use in elderly horses or those prone to digestive upsets brought about by stress. Dose: For horses: 50gof Coligone Powder to be mixed with feed and fed twice daily. For ponies feed 25g of Coligone Powder mixed with feed and fed twice daily. 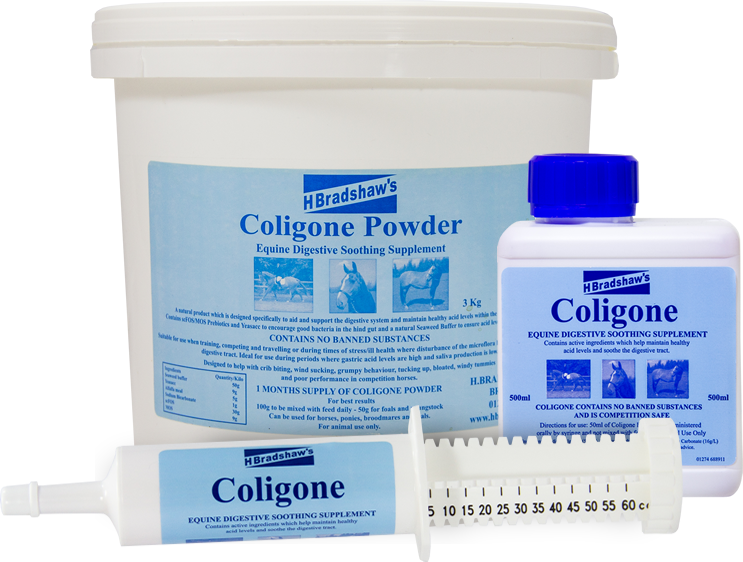 A 500g tub contains 1 months supply of Coligone Powder for horses over 14.2hh or 2 months supply for foals/youngstock and ponies under 14.2hh. Adult horses over 14.2hh: 50ml: to be given orally twice daily or prior to competing or traveling. Ponies up to 15hh: 35ml to be administered orally twice daily or prior to competing or traveling. 50ml given orally or mixed with feed, twice a day, for 5-7 days, before reducing the amount fed to 30ml twice a day.